Thanksgiving week has historically been a positive time for the equity market. 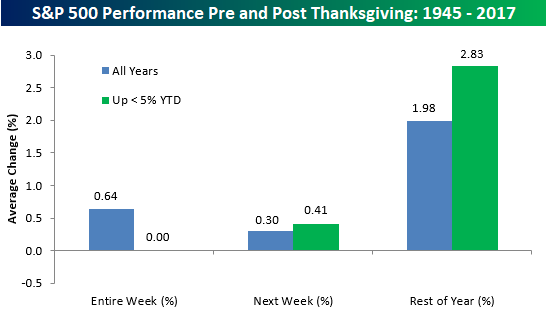 Since WWII, the S&P 500 has averaged a gain of 0.64% during Thanksgiving week with gains three-quarters of the time. Market trends heading into this Thanksgiving aren’t as positive for the bulls, though. As shown in the table below, during years where the S&P 500 was positive but up less than 5% YTD heading into Thanksgiving week, the index’s average change during the week has been 0.00% with gains less than half of the time. On a day to day basis, for both all years since WWII and in years where the S&P 500 was up less than 5% heading into Thanksgiving week, Monday has been the worst trading day as it is the only day of the week with negative average returns and positive returns less than half of the time. Tuesdays and Friday, however, have been positive days, though, with average gains of 0.10% and 0.29%, respectively. Additionally, for those years where the S&P 500 was up YTD but up less than 5%, Tuesdays and Fridays have been even stronger with average gains of 0.26% and 0.35%, respectively. As we move past Thanksgiving, though, seasonal trends for the market based on this year’s performance so far improve. 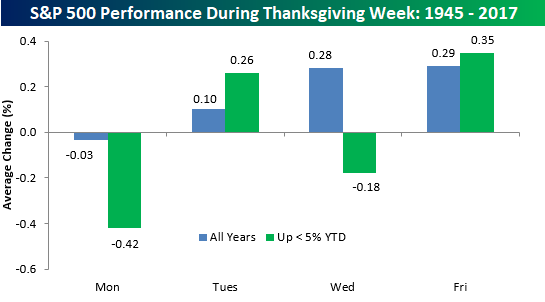 In those years where the S&P 500 was up less than 5% YTD heading into Thanksgiving week, the average gains the week after Thanksgiving was 0.41% with positive returns 55% of the time. For the remainder of the year, average returns were even stronger at +2.83%. Not bad for a period of just over five weeks!